If you have solar panels it makes it very difficult to repair or replace your roof. Any roofing company will not touch your panels. We can arrange to take down your solar panels for a short while, while the roof on your house is being restored. We can then put them back again a few days later, or we can relocate them to another roof. Most times we will store the panels at your house, but it is possible for us to take them away and bring them back later, if you are concerned about where to store them safely. Having problems with shade and you can’t fix the problem? Maybe it is a neighbour’s tree, or it’s too significant to chop back or down. If you are getting shade on your panels you are not getting the best value for money. Especially if it is shaded during the best daylight hours, during the middle of the day. We can look at the option of relocating your solar panels to another roof, or maybe just further over so you get less shade. Have you thought about taking your solar system with you? 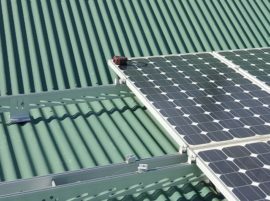 It is possible to take your solar system from one house to another, however it will mean that the installation on your new house has to be up to today’s standards, and both the panels and inverter must be current models. (sorry, that’s not our rules, we just have to follow them). Call us for a quote, it may be better to take your solar system with you, rather than buy a new system on your new house.